More than 30 protesters gathered outside the Scottish Rite Friday to peacefully protest provincial government social spending cuts while Treasury Board president Peter Bethlenfalvy spoke to the Hamilton Chamber of Commerce inside. The speech about "protecting what matters most" focused on efforts by the Ford Government to reduce government spending and create a better business climate. He pointed to Thursday's budget — and its efforts to reduce the provincial deficit over the next few years — as a step toward realizing the government's fiscal goals. 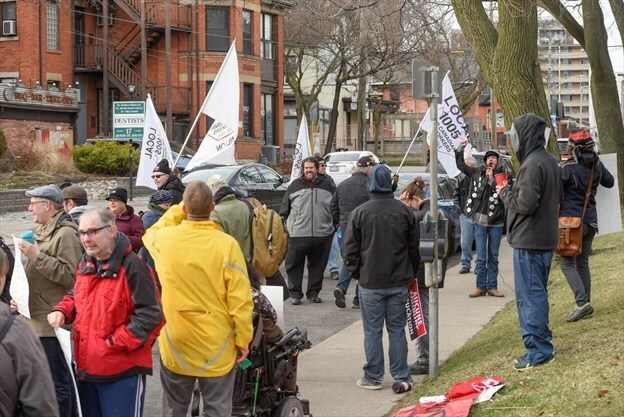 The protesters from the Hamilton and District Labour Council and ACORN (Association of community Organizations for Reform) criticized provincial cuts to, among other things, social assistance and social housing as well as the government's decision to roll back the minimum wage increase.